You probably know I’m a writer, but did you know I’m a ninja? “I love to wait!” said no one, EVER. And yet, we can’t seem to a avoid it. Have you ever had one of those grueling days when the river of creativity was so obstructed that you could count the literary drops that seeped through the cracks? I hate those days. It’s as if all my doubts, assumptions, and distractions have joined forces to build a damn, leaving me floundering in a dry and wordless riverbed. Happy Lunar New Year! 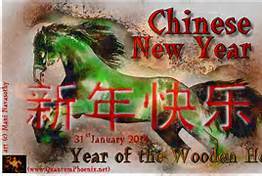 We are now in the Year of the Green Wooden Horse and I’m excited about the possibilities. Already I am feeling more focused, energized, and committed. I’m not entirely sure this has to do with the Chinese zodiac, but from everything that I’ve read it seems as though the year of the horse holds great promise for success. That is, if we’re willing to put in some diligent effort!